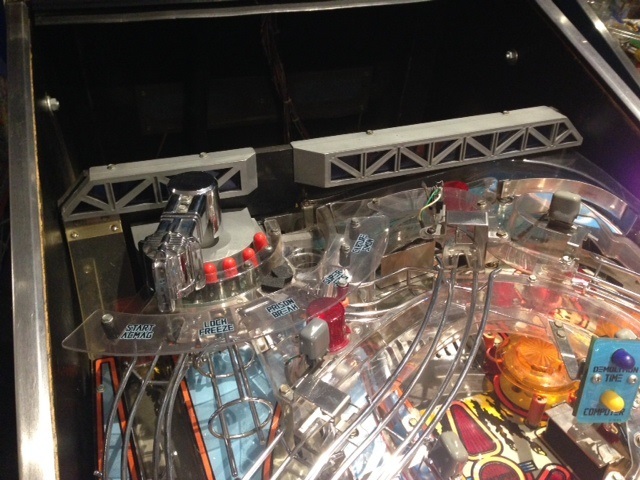 As a follow-up to yesterday’s interview with Art from Comet Pinball LED, I’d like to share a modification I made to my Demolition Man using Comet’s products. There are two plastic girders that run along the top of the backboard of the game that sit dark 95% of the time despite having transparent blue plastic worked into their design. This is an area begging to be lit up. There are three flashers back there…but their use is limited, leaving the plastics dark most of the time. The area in question: the two girders that run along the back of the game. In a recent Demolition Man refurb video by TNT Amusements, they drilled out an extra four or five holes in the backboard and install individual sockets so that superbright LEDs could be placed in there. This option makes for a very centralized and spotty lighting effect as you can see in the picture below. TNT Amusements attempt at lighting the same area with single super-bright LEDs. 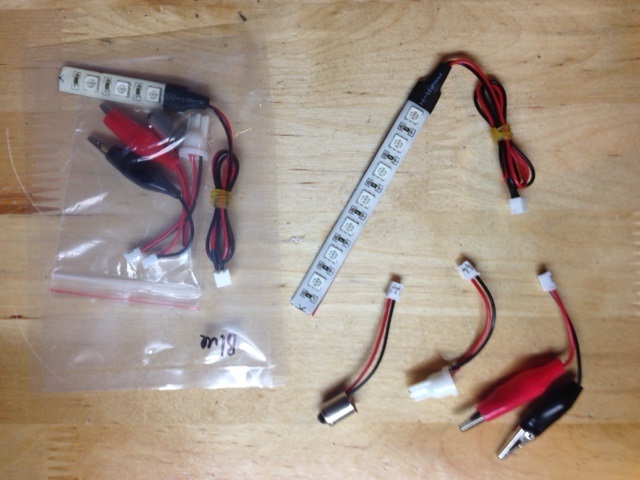 I picked up a few SMD light strips from Comet LED (a steal at $2.95USD per strip, available in both 3- and 7-SMD versions in a variety of colours available here). I hoped this would give the light more wash, rather than the centralized throw found in TNT’s modification of the game. As you can see from the image at right, each SMD strip comes complete with three different female ends, depending on how you want to hook up the lights. This also makes for less of a destructive footprint when drilling out the backboard: you need only drill a hole large enough to feed the male lead of the wire through, rather than having to feed an entire socket through. I went with Comet’s blue SMD strips…but I suppose white would have worked as well, as the transparent plastic already had a blue hue. 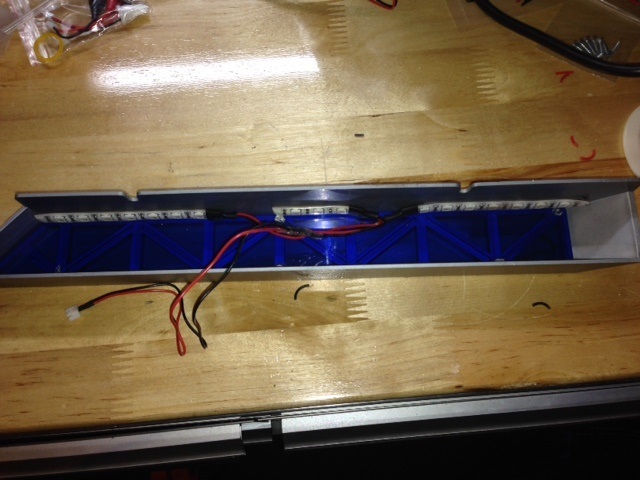 I wired up the lights for each plastic girder to one common lead as seen in the photo below. The smaller left girder was lit using two 3-SMD strips, and the larger right one (pictured below) was lit using two 7-SMDs and one 3-SMD. The strips can also be trimmed to any length needed. No permanent modification to the original plastic pieces themselves needed to be done…the SMD stips come with adhesive backing. Just make sure the area is clean before affixing the strips. I attached them to the inside top of the grey plastic allowing the SMD glow to shine downward rather than directly at the player. With a common lead for each, I needed only drill two holes in the backbox to feed the female lead through. Once fed through, I attached the male 47-bulb style end. To keep things tidy, I wired in two extra sockets off of the general illumination string that lights up the rear portion of the playfied (which are also mounted to the backside of the backboard). Leads plugged into the sockets and voila…a nice subtle blue glow to the upper rear of the playfield. The final product with a beautiful blue hue. I find it matches the overall “blue-ness” of the game, and makes for a great contrast against the red lights of the ACMAG and Cryo-Claw. Even with the area being constantly lit, the flashers still have a descernable effect when they are activated. The strip lighting is extremely versatile and the price point cannot be beat. These subtle lighting mods are a great way to make old games looking fresh. Check back for more lighting modifications using Comet Pinball LED products in the future. If you are going to change your incandescent bulbs to the brighter, more versatile, and more efficient light emitting diode bulbs (LEDs), you’ve got lots of options out there–in both LED style and the vendors who offer them. The choice can be absolutely overwhelming. And there is pressure to get it done right the first time…to completely LED a pingame with a pre-made kit through most LED vendors, it is going to cost you upwards of $200USD. In most cases, it is worth it, providing a fresh facelift to an otherwise tired-looking game. I subscribe to the LED philosophy “LESS IS MORE”, choosing to dot my general illumination, controlled inserts and backbox sparingly with LED bulbs, holding back on the use of excessive colour and blinding brightness. To date, all my LED needs have been filled by Arthur Haber at Comet Pinball. I placed my first order with Mr. Haber shortly after he opened for business, and I immediately got that warm and fuzzy feeling that I had ordered from the right place. Mr. Haber called (yes, on a telephone landline) to personally thank me for my order, which completely blew my mind…to think that kind of personal service still existed. Days later the LEDs were at my door complete with a few free extras, which included a small sampler pack of Comet products to try out in different areas of my games. 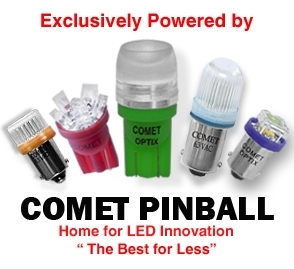 Comet Pinball, in my opinion, is the leader in online LED sales, offering a quality product, a wide range of options to fit your modding needs and absolutely unbeatable pricing. Comet Pinball does not offer $200 cookie-cutter kits. Rather, the site promotes experimentation and lighting the game to your own personal tastes, and in doing so will hit a price point that is much less than the cost of a pre-made kit. 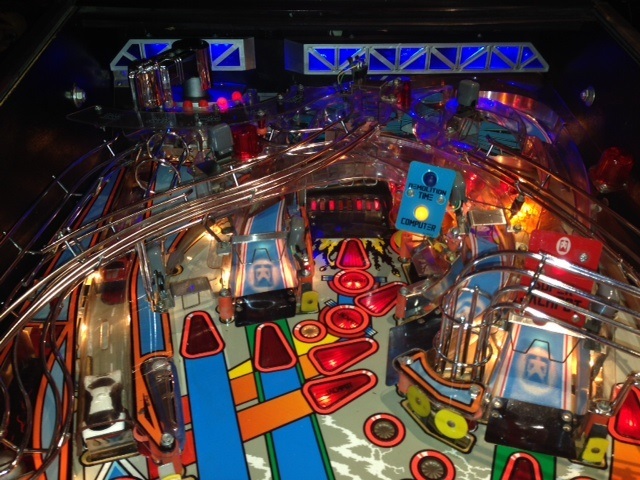 Mr. Haber is no stranger to me, we e-mail often, so it was only natural I ask him a few questions about his business and the state of the pinball LED union. Credit Dot: How long has Comet LED been in operation? Arthur Haber: The official website launch was September 2013, so we just celebrated our official “one year” anniversary. CD: How did you get into the LED business? AH: I had started experimenting with LEDs and Pinballs as far back as 1976. I started tinkering with LEDs and adding lights to pachinko and pinball machines. I was 16; they kept me entertained. Much later, maybe six years ago, I became more involved with lighting up machines, but mostly for my own needs. I felt there was a need for certain bulbs and lighting that were not available in the market. CD: Do you have a background in electronics? AH: None whatsoever, but I am learning fast. My background is in manufacturing, product development, and inventory management. CD: Putting lighting aside for a minute, how did you become interested in the pinball hobby? AH: I spent my childhood by the Rockaway Boardwalk. There were pictures of me playing Bingo Pinball, at about the age of three. I must have been eight years old, back in 1968, when I dropped my first nickel in a pinball machine. I’ve been pretty much hooked for 46 years now. CD: Does the “Comet” name derive from the colourful 80s Williams machine of the same name? AH: In part, yes…but I also collect meteorites so a lot of the meaning derives from that. CD: Where are your LEDs manufactured? AH: The majority of the product line is assembled in China; many components are from Singapore, Taiwan, and a few pieces from Malaysia. CD: What is communication like with a factory on the other side of the world? AH: Communication can be difficult sometimes–it reminds me when I ordered “red” and received “orange”, they thought they nailed it, but it was an unacceptable error to pass it on to my customers…many emails ensued. Mostly, it’s the time difference that is problematic…it means I am working until 4 AM. However, it is rewarding to learn about other cultures. CD: What factors do you take into consideration when developing new products? AH: I suppose it starts with looking at specific games, and finding that a different lighting solution is needed than is currently offered in the marketplace. In most cases, those solutions boil down to brightness and direction of throw. Many ideas for new products spring from the minds of fellow pinheads, and I’m grateful for all their help and suggestions. CD: So customer opinion and feedback greatly influence the development of new products? AH: Quite significantly. It has taken me a while to realize that any product will ride the full bell curve of opinion, but finding compromise is what I shoot for in many circumstances. CD: What is the development process like for you? Do you just dream it up and have the factory build it, or is there more to it on your end? AH: There really isn’t any set way. Sometimes, it starts with a sketch and then countless emails with the manufacturer to prototype the idea. Other times it’s an adaption of an existing product. I have sampled anything and everything unique in the world of LEDs I could find to see if they would have a viable use in pinball. From LEDs in sneakers, to military surplus–LEDs are now everywhere. I have toyed with everything from bicycle motion LEDs to Chinese military flashlight bulbs. CD: Competition is stiff in the LED world with lots of companies offering lighting solutions. What sets Comet apart? A Comet Pinball exclusive: the extremely versatile SMD light strips, available in both 3SMD and 7SMD versions in a variety of colours. AH: First, I hope people see our website uses a more efficient way of ordering. In entering a 3 page bulb order, there will be a massive amount of time saving compared to our competitors ordering systems. Our choice of product also sets us apart. Most vendors have offered three brightness levels, whereas we boast a dozen levels of brightness. We have a vast selection of exclusive products found nowhere else: our Op-Max double patented bulb throwing over 300 degrees of light, our 6.3V Colored LED Strips, and our Superflux line just to name a few. We also simply strive to have the lowest price we can and offer low shipping of $3.95, and free shipping with orders over $99. Finally, we have a different approach to lighting. The standard method has been the same size bulb everywhere in a game. By working with light brightness and throw, our philosophy is to control the lighting to one’s taste and work with different bulbs and brightness to create depth of field. CD: How can you achieve true depth of field with LEDs? 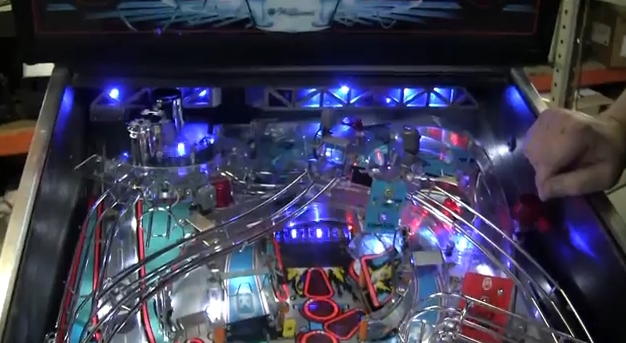 AH: Put brighter bulbs in the back of a game, it is amazing what 2-4 Op-Max can do in the back of a playfield in newer games with plastic layers. CD: You have a fierce commitment to keeping prices low. How do you keep your prices so competitive? AH: To toot my own horn a bit, it starts with being a good buyer. I already have factory production in four countries in the East; sourcing was done with the help of workers living in production centers. Business references were already tenured. Having a detailed Inventory Control system here keeps us efficient and prices low. CD: A few hours after placing my first order, my telephone rang, and it was you, calling to say thank you for my order…and we then proceeded to shoot the breeze about pinball games for a half-an-hour! Can you describe your unique approach to customer service? AH: That is likely best described as “getting old”! In my business and personal life, the Golden Rule (“Treat others how you’d like to be treated”) was what I was taught by my father, and taught to him by his father. I love pinball, and while this is a business, I still wish to keep it a hobby and a joy. In that regard, I see every order that comes through, and will e-mail, or call, based on something I see. We check each order to ensure customers received all possible discounts, and follow up if we see any anomalies. Also, I’m hoping this to be a “retirement business”. When I retire, I’ll be able to travel the country in an RV, and visit all my new pinhead friends I’ve gained through the business! CD: You are an active member on Pinside. Does this play a big part in promoting the business? Are there any challenges to being the owner of the company AND being a member of a public forum in such a small, tight-knit community? AH: Pinside is a great community of pinheads! Sharing my products with others like me makes me feel great, and indeed, is invaluable to the business side of things. While I was advised not to do it this way, I had to go with my gut, which was to approach it honestly. With many other great vendors out there, only through mutual success can we best serve the hobby. I describe my Pinside persona as “open”: my ears and eyes are open to the community to hear and observe their needs and respond to their feedback. Certainly there are business bumps such as differences of opinion. CD: You said to me once that LED use (and degree of LED use) is a very personal preference and a highly customizable experience. Is this the reason why you do not offer stock kits of LEDs for popular games? AH: That is one very good reason. Personal preferences start with the player…their age, their eyes, and their tastes are all factors. Next, you have to consider ambient lighting: are you playing with the lights on or off? A kit addresses only one view and that is fine in many cases. It is not hard to learn what brightness and lighting effects please an individual. The joy of doing this, and the unique result, is as personal as decorating a Christmas tree. I would like to think that most people would enjoy tweaking the look of their game immensely and having a completely unique result! However, it is also about cost. While you can save money purchasing a kit, if you purchase in bulk, you can save so much more–sometimes up to 50% less. 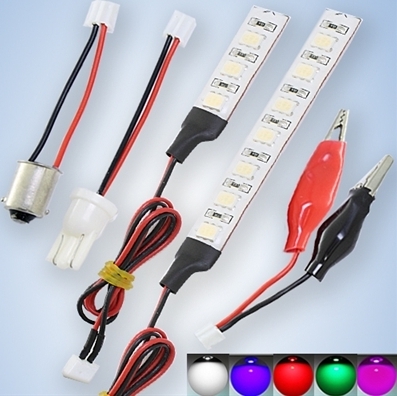 CD: Since you do not offer kits, what advice can you give or sampler packages can you recommend to potential customers who want to explore the LEDs you have to offer? AH: We are working on some additional information for the site, which we hope will serve as a good guide. Basically, it starts all with experimentation, and ends with having a few different types of each bulb handy to see what works best. CD: The LED detractors’ biggest complaint about LED use is “ghosting”. I’m under the understanding that this is a general term that is used to describe multiple phenomena–ghost, strobe, flicker. Can you briefly describe the difference between them, and what products you have available to combat these annoyances. AH: The technical difference for all these issues is pretty robust. But ghosting specifically is low residual current, still in the “line” that causes a few insert lights to faintly light when using LEDs. Bulbs deemed “non-ghosting” exist with several different methods of restricting this leftover voltage, keeping the bulb and insert truly “OFF” when they are supposed to be. Games, on average, can have from 2-8 bulbs that ghost. We carry two types of non-ghosting bulbs: Optix Super Flux, which is a no-ghost/no-flicker/reduced strobing bulb specifically for inserts, and a high quality non-ghosting product in three, and soon four, different types and brightness. CD: What is your best-selling bulb? LED (light emitting diode) bulbs on the left which have the light source encapsulated in a plastic lens versus the SMD (surface mounted diode) on the right which have their light source mounted directly on the face. AH: In single LEDs, it is the dome or bullet shape. Despite this, my personal favorite is still the flat-top bulb. In SMD, a standard 5050 frosted sells the best–it is the same bulb used in most “kits”. However, this is quickly being replaced by the twin 2835 SMD, the bulb used in Star Trek and the Walking Dead which is much, much brighter than standard bulbs! This allows inserts in yellow and orange to finally use yellow and orange bulbs and achieve a richer color rather than using 5050 Warm whites. Our Sunlight color, an exclusive, is the Kelvin between warm and natural white has been flying off the shelves as it is the perfect color for every game–just soft enough to reduce harshness, but still provides plenty of pop. CD: Can you offer any general tips or rules of thumb when experimenting with LEDs? AH: Set your baseline brightness for your general illumination first. Some pinball themes lend themselves to be bright, others to be naturally dark. Do you wish to play in the dark? Are your eyes sensitive to LEDs? These answers will allow you to choose the best brightness for general illumination. The inserts, as a general rule of thumb, should always be color matched, and we recommend brighter bulbs for larger inserts: a two SMD Faceted or 4 SMD to fill the whole insert with light. Backboxes are fun. For some backglass art you can use just one brightness, others have certain graphics that you’ll want to create a 3-D depth of field lighting by mixing several brightness levels to control light and shadow. LED and SMD lighting can really make the backbox art POP! CD: Can you give us a sneak peak at what is on the horizon for Comet? CD: Any closing words of advice for the pinball community? Please visit Comet Pinball at http://www.cometpinball.com. Mr. Haber can be reached at admin@cometpinball.com or can be found posting on Pinside under the handle “OLDPINGUY”. Categories: People | Tags: Arthur Haber, Comet Pinball, LED, SMD, SMD Light Strips | Permalink.